A study commissioned by the Eu-Ray, shows that the energy saving that can be obtained from a system of floor heating, Ranges from a 8% up to a 30%. Padua to compare the energy performance of three standard buildings (a detached house, a small office building and an industrial structure). They are based in Venice, Brussels o Stockholm, Using radiant heating or floor and are powered by a boiler condensing gas, a heat pump air or a geothermal heat pump. 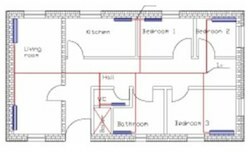 The diagram shows the floor plan of a house to a single floor with underfloor heating installed in a screed 65-75 mm and supplied with water heating 35-28 ° C.
Comparing the two heating systems, were found similar efficiencies; however, the floor heating reaches the same operating temperature to a temperature lower than ambient air, reducing energy losses due to air exchange, in the structure of the room. With regard to distribution losses, You are more losses pipe systems with radiators as radiators, compared with underfloor heating, require a higher flow temperature, nevertheless, most of these remain confined within the building envelope and reduce almost dell'85%, so it can be said that increase the yield of the heating elements. There were also similar energy losses through the auxiliary pumps and controls. In the three examples chosen, there were losses of storage but, in the case of such an eventuality, were treated as distribution losses. The most important differences were recorded comparing l 'generation efficiency: It is seen that the floor heating is very more efficient and provides heat at temperatures lower flow (35 against 50 ° C). 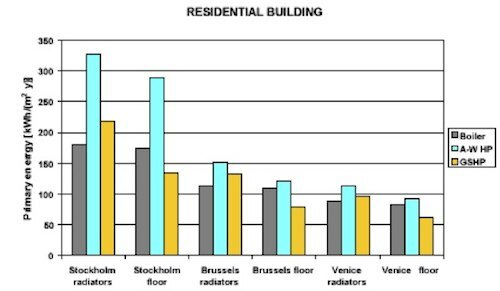 Considering the primary differences, for each structure built in three different cities, it was found that a building with floor heating uses less energy compared to the use of a radiator system. If the heating water coming from a boiler condensing gas, the reduction of energy and carbon dioxide emissions is about 5%; instead using a heat pump air o Geothermal, One has respectively a reduction the 20% and of 30%. Boiler - air-PDC PDC GEO. The data refer to a residential dwelling. The study is focused mainly on energy efficiency and emission reduction Co2 but also highlighted how, in the future, with the floor heating, The water plant could heat up without the use of fossil fuels. Normally, the body temperature and of human saliva is 37.4 ° C and few people consider the "hot", the investigation has shown that instead of a flow temperature colder than this, 35 ° C, is sufficient to heat a building with underfloor heating (even in the case of an office or an industrial structure). E 'is therefore clear that, by choosing a valid plant floor heating, You have immediate energy savings and lower emissions of Co2 but, above all, in the future it will continue to have effect by using lower water temperatures, in addition, you will eliminate the dependence on fossil fuels and the water will warm up in different ways sustainable ( solar-thermal, heat pumps, Electricity can be generated in the same building, wind, solar or heat and power unit). Failure to install underfloor heating in a new building or in one being restored in the future you will face a considerable expense to eliminate the heating at high temperature and replace it. With underfloor heating, the amount of energy used is lower and, using a heat pump, the savings are high, and this is significant because, in the future, to reduce fossil fuels, we should move to heat pumps. * The comparison was made with radiators dimensioned sent to 50 ° C. Usually plants with temosifoni are designed with flow temperature to 65-70 ° C. This means that the energy savings achievable in practice with a floor system is much higher.